Are you trying to lose those extra pounds but really miss your mashed potatoes?? 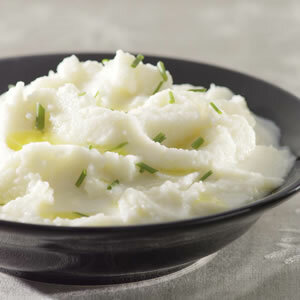 Here is a trick to get the creamy texture of mashed potatoes without all of the calories. This cauliflower whip is rich in B vitamins, vitamin C and fibre, while being low in calories. One cup of mashed potatoes usually contains 200 calories or more while this low calorie alternative has 100 calories per cup! Enjoy! 3. Transfer the cooked cauliflower, spices, garlic, salt, lemon juice and olive oil to a food processor or blender and puree until very smooth. Transfer to a medium bowl using a rubber spatula. Can be served hot or cold. Note: Feel free to play with the flavours. The curry option is just one option! Season with your favourite seasonings and spices!! TEFF PEANUT BUTTER CHOCOLATE CHIP COOKIES!